Update: According to T-Mobile, no announcements have been made for any future Blackberry products. I know that Blackberry posts are often met with a yawn and “next” mentality these days and I can’t say I necessarily blame that. Blackberry hasn’t really “innovated” in a long time — until yesterday and the introduction of Blackberry 10. We’ve seen hints of Blackberry 10 before, but yesterday’s keynote in Orlando at Blackberry World was the first moment Blackberry really tried to sound excited about their future. A future that is no doubt riding on our reaction to Blackberry 10. If you have waited months and months for this announcement, rest assured that T-Mobile has said they will carry Blackberry 10 devices before November. PhoneDog’s own Sydney Myers is on hand in Orlando and stopped to chat with some T-Mobile representatives who mentioned the November timeframe. You can check out The Verge hands on video below to see what’s available of Blackberry 10 in action. ← I’m Leaving The iPhone Behind And Going Android Only For 30 Days, Can I Be Converted? The last great true hardware-based T-Mobile WiFi calling device was the BB Bold 9700. From there on everything is app/software based like with Android, which is a crappy implementation of UMA. Curve 9300 is true UMA and now that I think about it the Curve 9360 is true UMA as well. 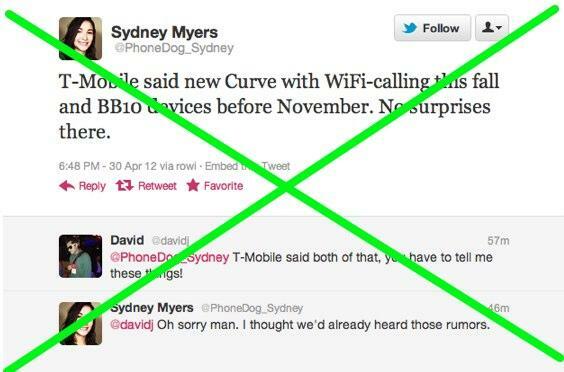 as a tmo sales rep, i can tell you no matter what they do bb is not gonna catch up. its rep is already ruined. But i am VERY impressed with this preview, im in love with that keyboard. Brilliant! Only thing I want from T-Mobile in the fall is a high end Window Phone 8 device. btw, that curve coming in the fall. Would the be the all touch screen Curve 9380? Not going to lie I’m impressed by this preview. I sent the video to my dad who was an avid BB user before switching to iPhone and he wants dates as to when this will see the light of day b/c he may switch back, but just as that is said my dad is 50+ year old business user so I can see people like him getting excited for this but as for my generation (the sub-30 y/olds) I think RIM has ruined it’s chances with us. I can’t see them coming back from the all of the hits it’s taken just in the past year alone beginning with that huge outage they had. Good job RIM, step your game up. HURRY up already…you are getting left in the dust. I am sooooooooooo stoked for BB10 devices. The faster they come out, the faster I can get my hands on one. It looks formidable versus ios and android. But need to see more. So far this looks to be te rope that pulls RIM up from the cliff. More like the Nokia Lumia than the iPhone, especially the screen icons just fewer of them. Lol! Blackberry Jam going on and even Rim haven’t made any announcements at their huge event. this is a step in the right direction definitely, now what ever the final product might be it better have free navigation in it, just my thoughts. I just sold my BB9700 and purchased a GNexus to hold me over until BB10. I don’t really like Android. I think my old blackberry still did simple things much better and honestly the only “plus” I see to android is the app market. I really hope they figure out how to either get the apps made for BB or be able to run android apps native. I’m torn between the two. I like having access to my bank info, stock trading, etc…. but the email on android is atrocious to say the least. It also takes forever to locate GPS and have been having it crash on me every day. Just my .2 cents…..